The latest batch of titles rounding off the Xbox Game Pass lineup in March and kickstarting the month of April. 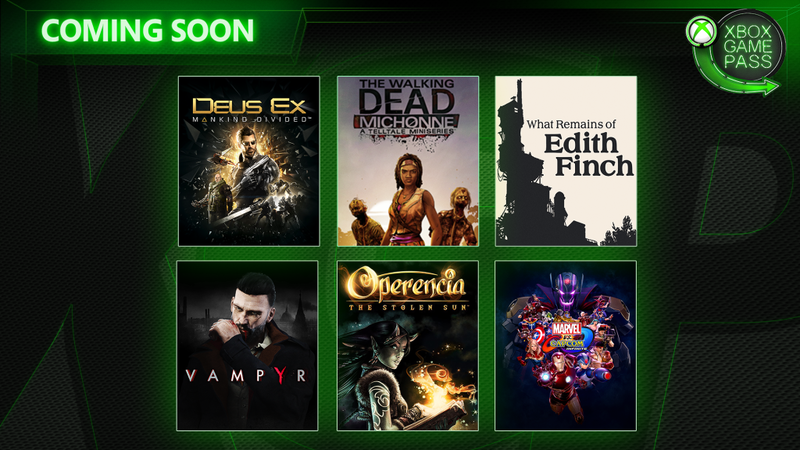 In a new blog post from Microsoft, it was revealed that six more games are coming to Xbox Game Pass between now and April 1. The first of these six games will hit Xbox Game Pass on March 21, while the last will arrive on April 1 followed by the arrival of Minecraft on April 4. Six more games are coming to Xbox Game Pass including What Remains of Edith Finch and Vampyr. Microsoft is constantly adding new games to their Xbox Game Pass service. For those who don’t have Xbox Game Pass, gamers can take advantage of a free 14-day trial in order to get a better feel for what’s on offer. Additionally, new subscribers can also get their first month of Xbox Game Pass for $1, which is a steal considering each month of Xbox Game Pass is regularly priced at $9.99. Rounding out the month of March, six more games are coming to Xbox Game Pass. Starting on March 21, What Remains of Edith Finch and Deus Ex: Mankind Divided will both be available on Xbox Game Pass. A week later, both Vampyr and The Walking Dead: Michonne from Telltale Games will launch on Xbox Game Pass starting March 28. On March 29, Xbox Game Pass owners will get access to Operencia: The Stolen Sun, while Marvel vs. Capcom is scheduled to kick off the month of April, arriving bright and early on April 1. Another thing for Xbox Game Pass owners to look forward to is the addition of Minecraft on April 4. Below, we’ve listed all games coming to Xbox Game Pass over the next few weeks! What do you think of the latest batch of games announced for Xbox Game Pass? Let us know down in the comments below! For more on Xbox Game Pass, be sure to recap their full lineup of titles, and learn more about how Xbox Game Pass owners get access to exclusive new games.